Camp Sessions will be held at the Case Soccer Complex (subject to weather – if inclement weather the sessions will be in the Chapman Indoor Facility). Campus map is at the bottom of this page. Park in E-Lot – Walk up hill to Building H on map – Case Soccer Complex is behind Building H on Map below. *If needed Indoor Facility is labelled E on map. For the Men’s Winter ID Camp, Soccer Synergy is working with the Crowne Plaza hotel (directly across the street) to provide the special rate of $79/night plus fees (more information on this soon). 4:30-5:00 PM Check In – ORU Aerobic Center. 5:15-7:00 PM Game #1 – Case Soccer Complex (Weather Contingency Plan – Chapman Facility “the Barn”). 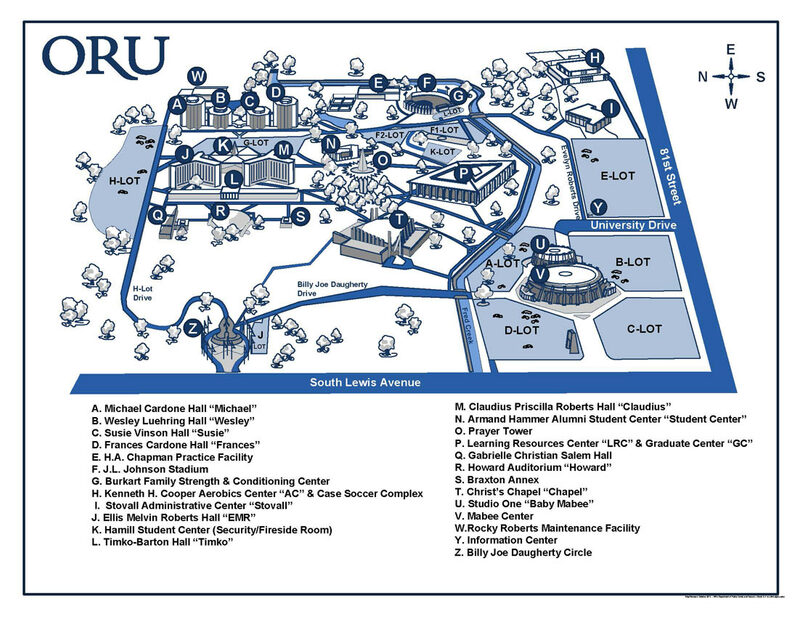 715-8:00 PM – Dinner and Introduction to ORU Soccer “Purpose & Paperclips” – ORU Aerobic Center. 9:45 – 10:30 AM – Classroom Session #1: “Leadership, Clay, and Bouncy Balls” – ORU Aerobics Center. 12:15 – 1:15 PM – Lunch & College Panel Discussion – ORU Aerobics Center. 6:30-7:45 PM – Dinner & Classrooms Session #2: “Game Models and Analysis” – ORU Aerobics Center. 9:30 – 10:15 AM Breakfast – ORU Aerobics Center. 10:15-10:50 AM – Classroom Session #3 – “Building a better soccer brain.” – ORU Aerobics Center. 11:00-1:00 PM – Game #2 – Case Soccer Complex. Each Camper will receive YouTube Links to the 11v11 Games played at the Men’s ID Camp ONLY (They will be sent via email after the camp). These can be utilized for personal player development and College Recruitment. A) 1V1– focusing on pressuring the ball, not diving, etc. B) 2V1– focusing on pressure/cover, body shape, etc. C) 2V2– focusing on making 2V1 situations, rotating pressure, etc. A) 4v4+– focusing on team shape, step/cover, etc. B) 4v3, 4v5,etc– focusing on defending as a unit, step.cover, etc. C) 5v5+– focusing on specific situations (forcing play wide, step cover, etc.